When a toddler starts coughing, it can be a source of concern for parents. When other symptoms are also present -- such as peeling skin on the fingers and toes -- it could indicate a more serious illness than a cold. However, these symptoms could be coincidental and might not be related to the same illness. Peeling skin can be caused by a variety of mild to serious illnesses and conditions that regularly affect children. Better Medicine.com advises that over-the-counter creams or lotions might remedy the problem, but peeling skin could be a symptom of a more serious condition. Allergic reactions are common in youngsters, but if the skin condition comes back quickly or is persistent, consult your child's pediatrician about treatment. Kawasaki disease is a rare illness that can present several symptoms, including respiratory problems that might include coughing as well as redness, swelling and peeling on the fingers and toes. In about 80 percent of all cases, Kawasaki disease will resolve itself without treatment. However, coronary damage can result in 15 to 20 percent of untreated Kawasaki disease cases. This illness is usually treated with antibiotics until a bacterial illness is excluded. Additionally, anti-inflammatory and fever-reducing medication is given throughout the early stages of the illness. 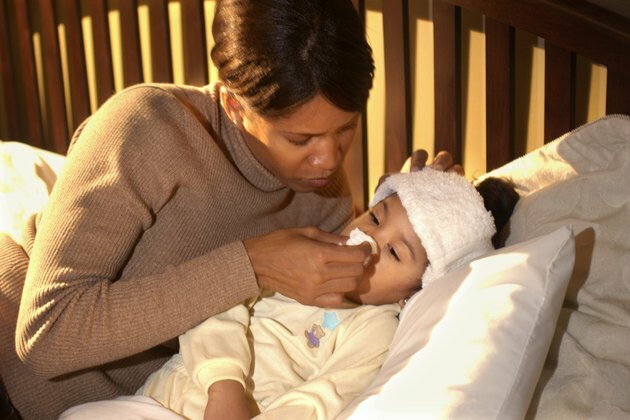 Strep throat is a bacterial infection that can make your child's throat feel sore and can lead to coughing. If untreated, strep throat might cause rheumatic fever, a serious condition. It can be accompanied by swelling, soreness and peeling in joints, including the fingers and toes. Preventing rheumatic fever from developing means taking your toddler to the doctor if there are signs of strep throat and administering the prescribed medication to keep it in check. Antibiotics, such as amoxicillin and penicillin, are the primary medications used to battle strep throat and keep it from developing into rheumatic fever. Allergies and inflammation also can cause peeling skin. In addition, conditions such as eczema, dermatitis and interactions with drugs can lead to itching on the fingers and toes. Psoriasis, athlete's foot and viral infections also could lead to peeling skin. Sunburn, vitamin deficiencies and harsh soaps also can be culprits in skin irritations.